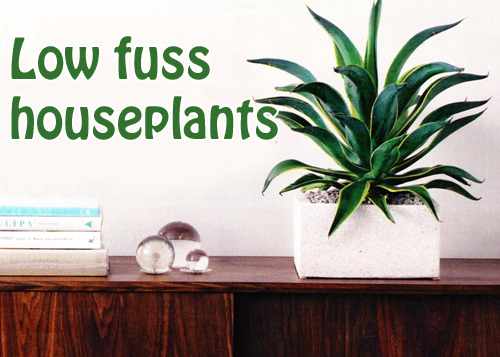 If every potted plant that enters your home seems doomed, try these easy no fuss options. 2. You are filling a dull corner. 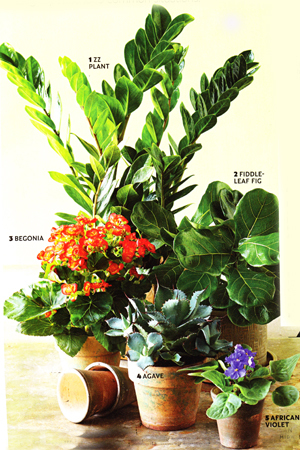 Add stunning height to any corner with this large leafed fiddle fig that is easily potted. It slowly grows to 12 feet unless pruned and actually gets brown edges if watered too much. 3. You want no hassle blooms then potting begonias flowers brighten both summer gardens and home interiors. Low maintenance angel wing and wax are tops, thanks to their continuous blooms in pinks, red and corals. Fertilize begonias to encourage flowering, and set them in a sunny window. 4. You like a sculptured potted plant. Place a silver agave in bright light and away from kids and pets. After that you don't have to do much other than admire it. 5. You have a plant eating pet!!!! Try African violets, which, won't harm pets. They do well in artificial light or indirect sunlight, producing adorable flowers in lavender, pink and white. These are easy to pot and lovely to look at. Read more.....Let's create an indoor herb garden. Read more.....Highlight your garden pottery with color.